Over a year has passed since it was first announced that Activision had signed a new licence to produce James Bond videogames taking over from Electronic Arts, but today the company confirmed their first 007 title is in the works. The reason for the year-long silence may be explained by the overlap in licences - EA's agreement does not conclude until September, from which point Activision will hold exclusive rights until 2014. Activision kicked off the German Games Convention 2007 on Wednesday 22nd August with an announcement that the company’s newest blockbuster franchise, James Bond, is in development by powerhouse studios Treyarch, Beenox and Vicarious Visions for next-generation consoles, Windows PC and hand-held platforms. MI6 can confirm that Treyarch are heading up development on Xbox 360 and PlayStation 3 consoles, with Beenox producing the PC version, and Vicarious Visions working on the hand-held platforms. Treyarch recently released "Call of Duty 3" and "Spider-Man 3". 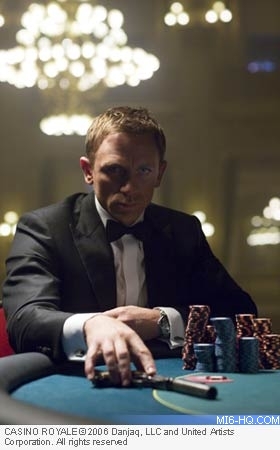 There is no official word on the content or release date for the game, but it is expected to be released to coincide with Bond 22 in November 2008 and may also feature elements of Casino Royale. Under the terms of the licencing agreement which lasts until 2014, Activision hold worldwide rights to create video games for all current and next-generation consoles, PC and hand-held platforms. The license grants Activision the right to develop and publish games based on all of the James Bond movies, as well as non-movie based games.